Summer's approaching and if you're like one of the many yearning for a few rays then you're likely to be heading to Spain at some point (a staggering 14 million of us Brits do every year). But how will you cope. Spain is well known for it's love of jamon (cured ham) and it's not uncommon to order something vegetarian only to be presented with a dish of lettuce, grated carrots and a strip of meat on top. You get funny looks as if everyone loves jamon, and you clearly made a mistake in ordering. Although your holiday is supposed to be relaxing, how can it be when you've no idea how to source animal-product-free (APF) snacks abroad let alone describe them in a foreign language! Spain's vegan community, though developing, is fairly well-hidden. So what if Malaga hosted the International Vegan Fair in 2013 or its airport has a vegan vending machine? That may help you get those all-important snacks before your 3 hours of vegan-free airspace on the flight home, but the real challenge is finding APF restaurants or bars, and knowing what you can safely order. Happily on any and every tapas menu in Spain, these small chunks of roast potatoes with a spicy-ish tomato sauce have the carbs you'll need to get you through a day of sightseeing. N.B. 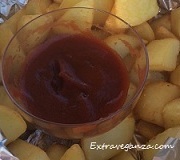 :They are sometimes served with mayonnaise as well as the tomato sauce, so you'll need to check. Here are three free Spanish phrases to get you by: "Salsa separada!" and "Salsa a parte" (which mean that sauce should be on the side) and "Sin huevos, sin leche" (without eggs and milk). 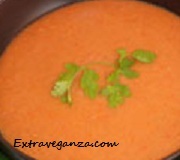 The word "vegan" isn't widely understood in Spain and "Vegetariana" does not quite cut it. This firm Spanish favourite is a true APF dish, even though it has a deliciously creamy texture that comes from the blend of olive oil and tomato. A perfect soup for any hot summer day. 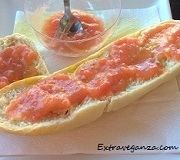 Pan con tomate is traditionally a breakfast food in Spain. It doesn't sound quite as glamorous in English and is, if we're honest, toasted bread with olive oil and tomato. However, something happens when the garlic mixture is rubbed elaborately into your toast, and salt is sprinkled over the tomato paste. It turns into a delicious breakfast that is completely APF. .
Lupin beans - gluten free and one of the highest sources of plant protein available (40%). These are Jack's magic beans, we swear. Readily available in supermarkets, and bars while drinking beer, these are crunchy and filling. And good for you. Who knew. 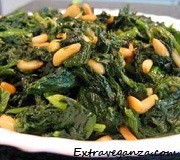 A Spanish staple: spinach fried in olive oil with pine nuts or chick peas. 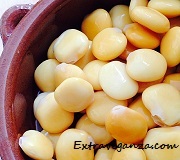 The standard recipes contain spinach, pine nuts or chick peas, onion, garlic, pepper and olive oil, occasionally with potatoes and carrots. This should be a safe bet and it tastes delicious.